Last Friday I attended my very first NASSCOM event in Kolkata. 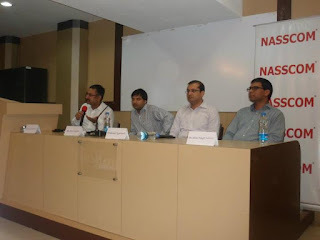 For those who are not aware, National Association of Software and Services Companies (NASSCOM) is a trade association of Indian Information Technology (IT) and Business Process Outsourcing (BPO) industry aimed at promoting and harnessing IT and Communications technologies for inclusive and balanced growth. The topic for the event was ‘How to establish a Niche in a growing market?’ It was presented as a panel discussion and was essentially an experience sharing session characterized by a lively interaction between the panelists and the audience. Udai Singh Solanki, MD & CTO, eRevMax was invited as a panelist and he was fabulous on the day. He was joined by Atul Agarwal, Managing Director, InSync Tech-Fin Solutions Ltd and Kamal Agarwala, Founder & CEO, Exactlly Group Of Companies while Indranil Choudhury, co-founder & CEO, Lexplosion Solutions Pvt Ltd moderated the panel. The session started with a round of introductions, post which the panelists shared their experiences on how they identified the niche segments in which their companies operate today and how they continue to lead in their segment. The topic was very close to the hearts of people on both sides of the table. Most of the attendees represented start-up firms providing products and services in highly specialized fields e.g. weather forecasting, engineering animation, to name a few. Other panelists mentioned how they became niche players by trial and error, as a part of evolving and trying to establish a sustainable business. For a few, the idea stemmed from understanding genuine concerns of customers and a passion to resolve it for them. For yet others the motivation came from a sense of weariness of corporate life and the need to do something challenging. The challenges faced by companies thereafter were quite similar. 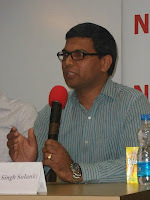 The discussions also touched upon how start-ups find it difficult to attract and retain the right talent pool. The importance of having the right team cannot be emphasized enough! It turned out to be a great session with meaningful takeaways for attendees. The panel discussion concluded with felicitation of the panelists followed by refreshments which provided networking opportunities to start-up owners keen for more ideas to push their business. Overall, a well organized and interesting session, and I look forward to other such events. 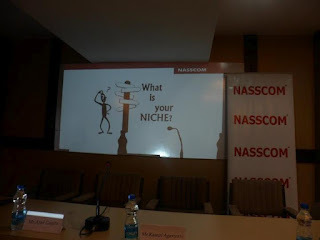 Kudos to NASSCOM for the job done well!